Arches National Park preserves over 2,000 natural sandstone arches, the greatest density of natural arches in the world. A state of the art visitor center and a team of well-informed park rangers provide educational interpretation to compliment the natural beauty of the area. Throughout the park, arches, spires, fins and other unusual rock formations reveal millions of years of geologic history. The extraordinary features of Arches National Park create a landscape of contrasting colors, landforms and textures that is unlike any other in the world. 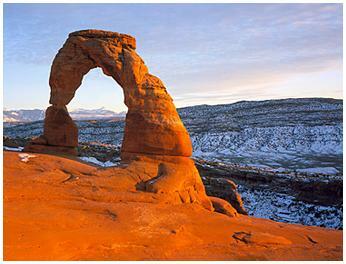 Arches is located in a "high desert," with elevations ranging from 4,085 to 5,653 feet above sea level. The climate is one of very hot summers, cold winters and very little rainfall. Even on a daily basis, temperatures may fluctuate as much as 50 degrees. Tag-A-Long Expeditions, running the Colorado River and exploring Canyonlands since 1964. Accomodations, restaurant, winery, museum, river and land adventures, weddings & events. Moab's only New Zealand Style Jet Boat Tours on the Colorado River. This boat is designed for shallow braided rivers, rapids and 360 spins!